Modern computing systems connect in an almost incomprehensible number of ways. When we talk about network connections, many of the options are familiar. However, when we talk about connections between the computing system and the machines that run a factory or manufacturing floor, the specifics can be far more confusing. When systems that weren’t necessarily designed to interact are suddenly asked to communicate effectively, it can be a challenge to identify the best way to ensure everything is speaking the same language. The emergence of the Industrial Internet of Things (IIoT) has put a new focus on connectivity and one re-emerging technology, DIO, has become an increasingly popular option for many industrial PC users. But what exactly is DIO, how is it currently being used and how might it be employed in future innovations? DIO, or Digital Input/Output, is a simple form of interface used in a wide range of systems to effectively relay digital signals from sensors, transducers and mechanical equipment to other electrical circuits and devices. Sometimes referred to as General Purpose Input/Output (GPIO), DIO utilizes a logic signal to transfer information. Unlike an analog signal which might be comprised of varying voltages, the digital signals used by DIO have two possible values and are generally represented as either OFF or ON. Think of analog signals as those you might use a knob to set, while digital signals would most often be controlled by a switch. This makes DIO ideal for sensing switch contacts, reacting to motion sensors, limit switches, operator buttons or machinery status indicators. DIO can be used to control indicator lights, small relays or PLCs within equipment. DIO comes in two forms, non-isolated and isolated. Isolated DIO, as its name would suggest, offers the additional advantage of providing electrical isolation of digital signals, allowing for higher signal levels (0-24V), reducing possible component damage, avoiding ground loops and allowing for safer interfacing to external devices. 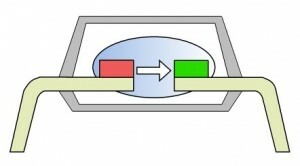 This isolation is most often achieved by converting the incoming signal to light and passing it through a closed optical channel via tiny LEDs within an Opto-isolator. The image to the right shows a cross section of a common opto-isolator configuration, with the incoming signal being transmitted via the red LED to the green sensor where it can be passed to the receiving device, allowing the signal to be transferred without any physical contact between the two sides of the circuit. One key consideration when utilizing isolated DIO is power. Because there is no physical connection between the incoming and outgoing signal, power must be separately supplied to the receiving side of the circuit. Fortunately, many modern DIO modules provide a dedicated Isolated 5V Out expressly for the purpose of providing power to the output, or external, side of the circuit. What is DIO Used For? Industrial environments are notorious for being hard on electrical equipment. 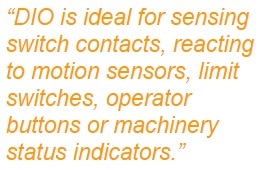 Dust, moisture, vibration and other common environmental factors make DIO an excellent option for ensuring signal integrity in the increasingly connected industrial world. As automation continues to expand, computers and machinery are more commonly required to communicate, and the sheer number of OFF/ON signals needing to be sent and received is staggering. DIO can be employed to detect and display machinery status, to automate maintenance requests, halt operation in the event of a malfunction, or monitor tooling parameters. DIO is often called General Purpose I/O for a reason, its potential uses are almost limitless. How do Different Companies Handle DIO? Unlike most other I/O ports, DIO connections are not fully standardized, meaning that a DIO port on one piece of equipment might look very different to the DIO port on another. Understanding how a specific DIO module has been configured is important to ensuring proper interfacing. 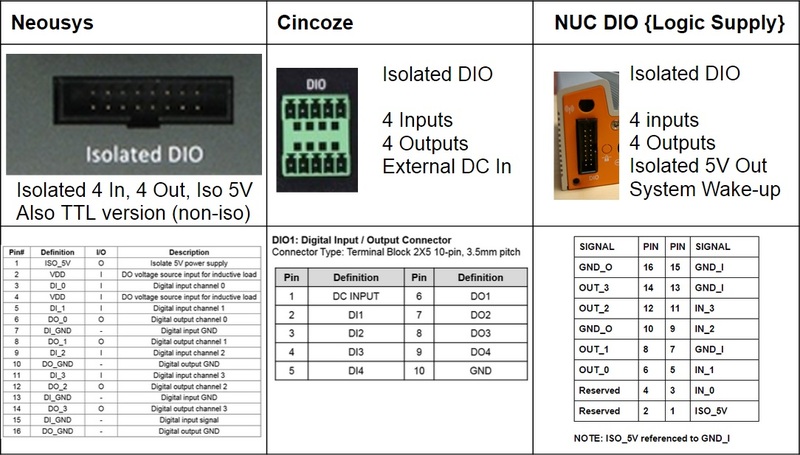 Below are examples of the features and pinouts of a few different DIO ports. DIO helps provide a link between the people and the machines that make up the quickly-evolving Internet of Things. By allowing for direct and remote management of systems and devices, DIO plays a key role in ensuring effective communication between systems and their operators while allowing for faster response to monitored events, easing factory automation, streamlining performance analysis and optimizing throughput. As manufacturers and end users begin to employ DIO in their hardware infrastructure, its uses will continue to evolve in kind, and with the modern factory and production floor becoming increasingly complex, the future for DIO development and implementation looks bright.